In poor countries, livestock and fish feed billions. 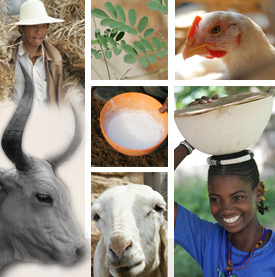 In East Africa, for example, livestock provide poor people with one tenth of their energy and one quarter of their protein needs. Fish account for more than half of the animal protein intake for the 400 million poorest people in Africa and South Asia. Meat, milk, eggs and fish are important sources of the micronutrients and high quality proteins essential for growth and health. While animal-source foods have many benefits, research has to address not only how to get more meat, milk, fish and eggs to poor people, but also to get less of it to those who are eating too much, or the wrong types. Moreover, animal source foods are important sources of biological and chemical hazards that cause sickness and death. A central pillar of ILRI’s work in this area is that food should not only be ‘safe’ (that is, free from hazards and improving rather than worsening diets) but also ‘fair’ (that is, give the maximum opportunities to the poor involved in food production and sale and also improve, or not worsen, the position of women who now have an important role in food production and sale). 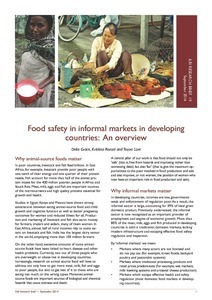 Three research briefs explain the importance of safe and fair food, and informal markets. Download brief 20: Food safety in informal markets in developing countries: Lessons from research by the International Livestock Research Institute.